Who doesn't love the excitement of receiving a hamper packed full of all your favourite goodies in the post? With an iHampers voucher code you can enjoy fantastic savings on a wide range of hampers, baskets and boxes stuffed with cheeses, wines, sweets and all manner of gourmet treats. Whether you're celebrating a special occasion or just want to keep your cupboard stocked with all the finest food supplies, an iHampers voucher code will help you shop for less. Part of the Colonial Gifts Ltd. company founded by David Price and Steven Harris in 2006, iHampers is a dedicated hamper delivery service committed to supplying the very finest food and drink to homes around the UK. As one of the UK's favourite hamper companies, they can be relied on to deliver the very highest quality hampers and the very best customer service time and time again. At iHampers, customers can browse a wide range of pre-made hampers to find the perfect one to suit their tastes. Looking for the perfect hamper for the festive season? The company's wide selection of Christmas hampers has something to suit every table, from Yuletide Celebration baskets loaded with biscuits, chutney, wine and cake to deluxe deli pairings of treats like port and Stilton or the more unusual Muscadet and salmon. Of course, you don't need Christmas as an excuse to ditch the diet and eat like a king – iHampers' delicious collections are available all year round. Why not treat that special someone in your life to a deluxe 'Cheese Larder' featuring classic British cheeses along with some tempting accompaniments, or indulge your sweet tooth with a mouthwatering chocolate hamper complete with truffles, cookies and sweets as well as perfectly chosen wines. iHampers are committed to providing delectable treats that everyone can enjoy, so if you have special dietary requirements you just need to ask and they will design a hamper to suit your needs. From special hampers for diabetics to alcohol-free hampers and gluten-free options, there really is something for everyone. Want to send a personalised hamper as a gift? With iHampers you can design your own branded gift box, wine bottle or basket with a message and name of your choice – or add your own corporate branding to make excellent gifts for important clients. Want to get shopping with iHampers? With an iHampers voucher code you can get great discounts off your final bill. So whether you're splashing out on a special treat for someone else or just indulging your own cravings for the finest cheese and wine, an iHampers voucher code will save you money while you shop. Browse our website until you find an iHampers voucher code that suits you, then navigate to their website to begin shopping. Click on a product for more information, then enter your desired delivery date and click 'Buy now' to purchase. Enter your iHampers voucher code in the box provided and click 'Apply voucher code'. If you've enjoyed shopping for hampers and more at iHampers, you might also like to check out more great deals on gourmet food at stores like Ocado and Waitrose. Or, if those aren't up your street, you'll find plenty more stores to browse in our Food and Drink section. Choose a shipping option and click 'Confirm delivery method'. Enter your payment details and click 'Confirm purchase'. Standard UK delivery is free on all orders. Express shipping is available for a small fee. Need to contact the team at iHampers? Whether you have a question about your order, want to find out more about specially designed hampers for those with dietary requirements or simply want to find out how you could make big savings with an iHampers voucher code, you can contact the Customer Services department by telephoning 0333 000 0221. Want to find out more about the delicious hampers packed with gourmet treats available at iHampers? The company maintains a profile across all your favourite social media platforms. Follow them for lots of exclusive content such as competitions, special offers, recipe ideas, product reviews and much more. You can also use these pages to find out more about saving money with an iHampers voucher code. Don’t forget to check them regularly, as you can never be sure when a free iHampers voucher code might be waiting for you! Buy now online at www.ihampers.co.uk. I love giving food and drink hampers as gifts at Christmas, which is why I was delighted to discover how much money I could save with an iHampers voucher code. 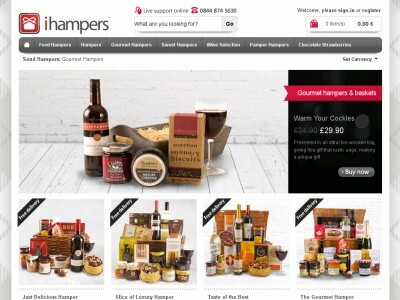 ihampers.co.uk stocks a fantastic range of gourmet hampers – all available at a discount with an iHampers voucher. This month, I used my iHampers discount code to get great deals on a cheese hamper for my dairy-loving sister as well as a beautiful wicker hamper for myself as a treat. So if you want to enjoy fantastic savings on a range of delicious treats, check out the latest iHampers vouchers.